Mini FPV quad copter kit for V929 or HK Q-bot by 3dxl is licensed under the Creative Commons - Attribution - Share Alike license. Introducing my custom designed compact mini quad frame for FPV flight: XL-RCM 6.0 EXO. This frame kit designed for V929 or MQX/Hobby King Q-bot generic mini quad copter for FPV conversion. Now it looks like portable mini drone. Design to be ultimate solution to facilitate and ease building mini quad for fpv using common parts available at hobby shop as this kit already have place holder for generic FPV hardware available in the market. The quad complete FPV build weight not including lipo battery is only around 60gram. Flying weight estimated at 80gram if 808 #16 HD cam mounted as optional below the frame. 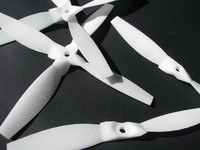 3D printed in ABS plastic provide lightwieght solution for endurance and long range flight. With TGY-9X radio and 200mw nano will provide 1~1.5km of flight range. The main frame is compact and slim compare against commercial version and the rotor to rotor hub width is slightly longer due to arm displacement from the frame sockets thus provide better stability for outdoor flight. **I've already include diagram of electronic hardware installation. Please check for those who are new into FPV installation.